Baseball -- Dodgers versus Braves, 1958. 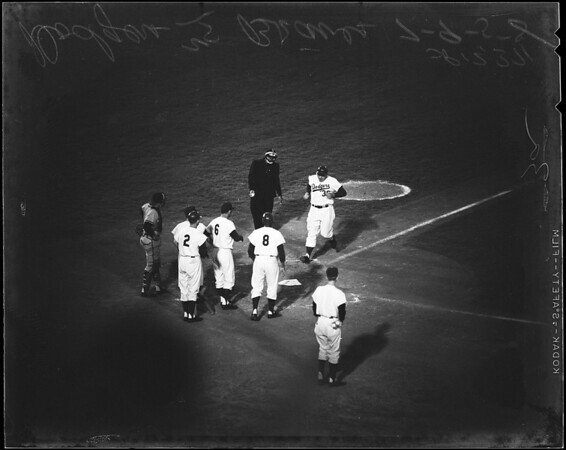 Caption slip reads: "1: Frank Torre out at 1st by Bilko. 2: Bilko hit home run. 3: Bilko brings in 3 runs -- crosses home -- Roseboro & Furillo. 4: Mathews to Red Schoendienst forces Jackson at 2nd. 2nd inning: 5: Neal to Williams to put out Wes Covington at 1st".